You are here: Home › Posts › Tips › What kind of brochure do you need? Most companies need a brochure of some sort to help sell their products or services. Brochures can do many jobs and sell many kinds of products so working out how to get the best brochure for your business needs can be tricky. What do you need to tell people? How will you be delivering your brochure? 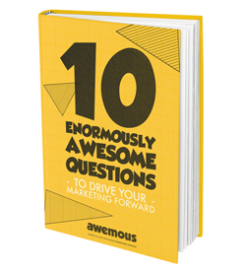 Once we know the answers to these we plug it into our super clever Brochure Matrix™ and we can deduce what kind of brochure is needed and help our clients plan their content. How? Let’s look at these two questions, and possible answers to each, in a bit more detail. About our amazing end results. You need a brand image or coffee table brochure. This is a largely image based brochure that focuses on the end results your business creates rather than individual products or services. If you are a manufacturing company this brochure shows lifestyle images of your products in-situ with end users. If you are a services company this brochure shows how relaxed/safe/organised etc your end users are because of using your services. High quality, professional imagery is super important for this kind of brochure. The design is beautiful, often with a light touch that allows the images to be the stars. To pull this type of brochure off you need to have a clear idea of your point of difference, your brand messages and the problems you solve for your customers. Our branding workbook can help with this. About our fantastic services. You need an about us or portfolio brochure. This is a mostly text based brochure usually between 12-24 pages long with sections that can include About Us, Our Services, Our Sectors, How We Work, Why Choose Us. The design is on-brand and clear. Images are often of staff doing their jobs or of final projects – possibly as part of a case study. About our incredible products. You need a product catalogue. These generally contain images and technical details of every product your company offers so can be very large brochures. Imagery is a combination of product shots and lifestyle images if appropriate for your business but they should all be high quality. The layout is designed to be clear and easy to read while allowing your best images to sing. It is a working document for both sales teams and customers and can be directly correlated to sales. About our mind blowing prices. You need a price list brochure. A utilitarian document that mostly consists of pricing tables and some product information. Images of selected products can be included to make the brochure more eye-catching and to highlight new or high margin products. These can end up being large, complicated brochures so the job of the design is to make finding information easy for both customers and sales teams. Of course you can mix and match a little, for instance you might want to add some information about your end results to a product catalogue and this can work really well. However the more you add to a brochure, the more diluted its purpose becomes, a brochure that is a catalogue and price list supported by case studies with a coffee table style introduction can start to feel very confusing (and very long and probably very expensive). Sending it to potential new customers. This is a Cold Call brochure that you send to a list of people that haven’t requested the information and most likely don’t know you exist. This is a first impression so it must look good and give the right information without overwhelming new customers. If you are sending to a large list of people then price will become a consideration. You don’t really want to be sending out a brochure that has a £10 unit cost to tens of 1000s of cold contacts, in this case a smaller, shorter, more simple brochure may be more appropriate. Send or give to customers who ask for it. This is a Customer request brochure. This goes out to ‘warm leads’. They might be people who have visited your website and asked for more information or they might have chatted with you at an event. These potential customers already know something about you and are interested enough to want to know more. This can be the trickiest brochure to create as the content and format completely depend on what the customers already know about you and the type of business you have, a small eight page leaflet could do the job but equally a 160 page price list might be the right thing here. This needs careful thought. Give to the sales team. 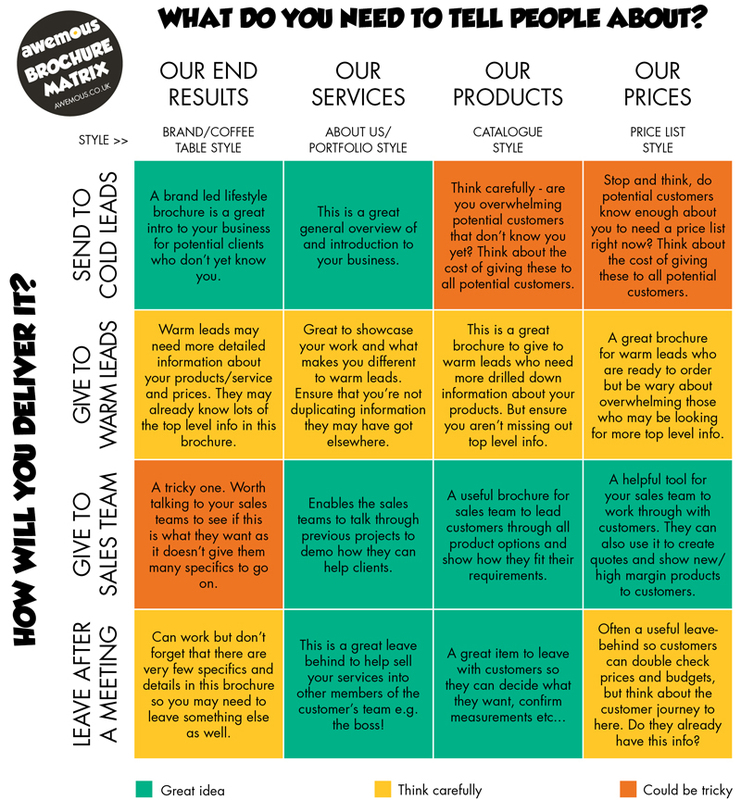 This is a Sales Support Brochure, a tool for your sales team to use in meetings with both new and existing customers. This gives the sales teams all the information they need to close a sale. What this is will vary from company to company and this brochure should be created in partnership with your sales team – find out what they need and how they will use it and keep them in the loop during production. Leave with customers after a meeting. This is a Leave Behind Brochure and is something you leave with a client after a meeting to remind them of you. It should give them a clear call to action for how to get in touch and answer any lingering questions they may have about your company, products or service. This will differ from business to business and the journey to this point should be taken into account. If they will have already been given a price list and a quote by a rep then maybe a more top level brochure is best here. Again it is possible that you need a brochure that will do more than one of these jobs but, as before, the more you try and do the more you weaken the effectiveness of your brochure. Designing a brochure that works as a cold calling piece of marketing as well as something for warm leads, sales teams and as a leave behind starts to be a very complicated job. You’ll also need to take your answer to the first question into account as the two work hand in hand with each other. Plugging this into the Brochure Matrix™. You need to think of these questions as a grid (see image below) where what you choose on one side affects your choices on the other. Some styles and delivery mechanisms don’t work well together and some are matches made in marketing heaven. For instance a coffee table style brochure is probably not a great idea as a sales support tool, equally a large, detailed price list might not be right to send to cold contacts that know nothing about you. You can see our thoughts about each match up in the Brochure Matrix™. It’s crucial to remember that each business is unique and what works for some won’t for others and vice versa. If you’re struggling to work out a plan of attack for your next brochure get in touch with Awemous and we can walk you through it.